Controlling hunger is crucial to weight loss. How do you reign in hunger? We all think that eating more or eating more often will prevent hunger, but is this really true? Standard dietary advice is to eat 6 or 7 small meals per day with the hope that this will stave off hunger and prevent overeating. If you can prevent hunger, then you may also be able to make better food choices. On the surface, it seems pretty reasonable. However, on the surface, the disastrous Eat Less, Move More or Calories in Calories out paradigms also seemed pretty reasonable, too. Like fool’s gold, appearances can be deceiving, and we must dig deeper to appreciate the truth, otherwise we are the fools. So, let’s think about this a little more. The most important determinant of how much you eat is how hungry you are. Yes, you can deliberately eat less, but you can’t decide to be less hungry. So if you are constantly eating less, but are still hungry, it takes a toll on you, day after day, month after month, year after year. And the moment you let your guard down, you are going to eat more. You are constantly fighting with your own body. If you are less hungry, then you’ll eat less. But you’ll be working with your body, not against it. Obesity, as I’ve explained in my book, The Obesity Code, is not a disorder of too many calories. It’s a hormonal imbalance of hyperinsulinemia. The main reason we eat more calories is not lack of willpower, it’s hunger. And hunger and satiety are functions of our hormones. You can decide what to eat, but you can’t decide to be less hungry. In the long term, it is the amount of hunger that determines how much you eat. On the other side, ‘Calories Out’ is not primarily a function of exercise. It’s determined mainly by the basal metabolic rate, which is the amount of energy (calories) required to keep our body in good working order. Energy is needed to generate body heat and to keep the heart, lung, kidneys and other vital organs working properly. You can exercise more, but you can’t decide to have a higher metabolic rate. It doesn’t work like that. And neither is the metabolic rate stable over time. It can fluctuate up or down 40% depending upon our hormones. Fat accumulation, even from a Calories In, Calories Out standpoint is almost entirely a hormonal problem. It is not something that people ‘decided’ to do. Nobody decided they wanted to eat more so that they could get fat. They ate more because their hunger wasn’t satisfied. And there are many different reasons for that – mental and physiological. But the bottom line is that obesity is not merely the lack of willpower or a bad choice that somebody made. It’s a disease that deserves compassion. Cutting calories when the problem is hormonal is not going to work. And guess what? It doesn’t. Is there any evidence to suggest that eating constantly will prevent hunger? That would be a big NO. Somebody made it up, and it’s been repeated so many times that people assume it’s true. Mostly, it’s been promoted heavily by the snack food industry to make sure that people continue to buy their products. Up until the 1970s or so, people ate 3 meals per day – breakfast, lunch and dinner. It was unusual to snack and certainly not considered a healthy habit. It was an indulgence to be done very occasionally. Eating constantly is sort of a nuisance. If you are trying to eat 6 or 7 times per day, then when are you supposed to get your work done? You are constantly thinking about what you need to eat and when to eat it. Anyways, it is clearly not necessary to snack because our body stores food energy (calories) as body fat for the exact reason of providing calories when needed. Body fat exists precisely so that we do NOT need to constantly eat. But is it useful to prevent hunger? Hold it until you find a washroom. Pee just a tiny little amount and then stop yourself voluntarily. Do this repeatedly throughout the day, each time stopping before your bladder is empty. Once that first bit of urine come out, there’s no stopping until it’s done. It’s incredibly hard to stop once you start. That’s inertia. An object in motion tends to stay in motion until something else acts to stop it. Let’s think about another situation. Suppose you are thirsty Which is easier? When you find water, you drink until you are no longer thirsty. Drink a thimbleful of water and then voluntarily stop drinking while looking at the full glass of ice-cold water. Do this repeatedly throughout the day. Again, you and I both know that once you get that first sip, there’s no stopping until the glass is empty. Once you start, it is easier to continue until satisfied, whether it’s emptying your bladder or slaking your thirst. It’s like my son. You can’t ever get him into the bath. Once he’s in, you can’t ever get him out of the bath. But this is normal behaviour. So why do we assume this does not apply to eating? You might believe that eating a small amount constantly or ‘grazing’ will prevent overeating. If this were true, what is the point of an appetizer? The hors d’oeuvre is literally served ‘outside the main meal’. For what purpose do we serve an appetizer? Is the point to spoil our dinner so that we cannot eat what the host has slaved over all day because we are full? Really? No. The whole point of an appetizer is that this is a small tasty morsel to make us eat more. Eating a small, appetizing amount makes us hungrier, not less. The reason it works is because it overcomes that initial inertia. The appetizer starts us salivating and thinking about food and therefore our appetite increases. In French, this may also be called an amuse bouche – meaning literally ‘something that amuses the mouth’. Why? So that we will eat more. It might be oysters, stuffed eggs or nuts. It’s not served to fill you up so that you can’t eat that expensive intricate meal prepared by the chef. Virtually all cultures in the world have a culinary tradition of whetting the appetite. The ancient Greeks and Romans stimulated their guest’s appetite with little bits of fish, seasoned vegetables, cheese and olives. The Italian Renaissance writer Platina recommended thin rolls of grilled veal. Giving too large a portion would stimulate the satiety hormones, and dull the appetite. But a tiny portion almost paradoxically stimulates the appetite. This appetizing effect is no secret – being known to any person who has ever thrown a dinner party over the last 200 years. Now think about a time where you weren’t really all that hungry, but it was breakfast time anyways. So, you eat because people have always said it’s the most important meal of the day. To your surprise, as you start eating, you finished an entire meal relatively normally. Before you started eating, you could have easily skipped the meal and have been full. But once you started eating, you ate everything. Has this happened to you? It’s happened to me many, many times, mostly because I’m always aware of this fact. Eating when you are not hungry is not a good strategy for weight loss. Yet people are continually scolded for having the temerity to skip a single meal or snack. They are admonished to be sure to never miss a snack. If we eat small meals 6 or 7 times per day, as most dietary authorities recommend, then what we are doing is giving ourselves appetizers but then deliberately stopping before we are actually satiated. And then repeating that multiple times per day. This is not going to decrease our appetites, it will increase it, a lot. Now because we are hungry but have not eaten our fill, we must exert a significant amount of willpower to stop ourselves from eating. We count our calories, but we don’t count the willpower we’ve spent to stop ourselves from eating. Day after day it goes on. Eating WHETS the appetite. Got it? We’ve known this for at least 150 years! Eating all the time so that you’ll eat less soundsreally stupid, because it isreally stupid. Don’t fall for it. If you hear a doctor or dietician giving you this advice, run far, far away, very, very quickly. They will literally kill you with this idiotic advice. So if eating more frequently gives you a bigger appetite, then the converse must be that eating less frequently gives you a smaller appetite. Luckily, this turns out to be true. Ghrelin, originally purified in 1999 from rat stomachs, is the so-called hunger hormone. It strongly stimulates growth hormone, and increases appetite. So, if you want to lose weight on a long-term basis, you need to tune down ghrelin. So, how to do that? 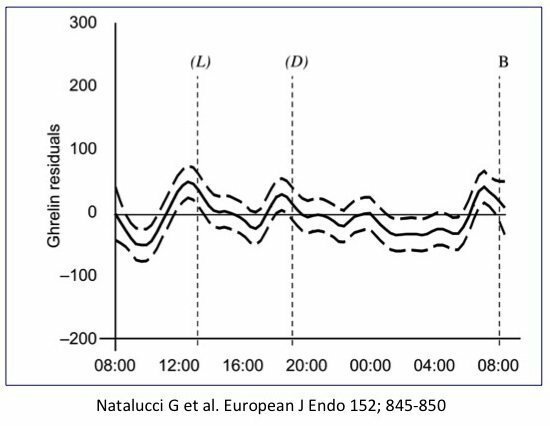 In one study Patients undertook a 33 hour fast, and ghrelin was measured every 20 minutes. Here’s what ghrelin levels look like over time. Ghrelin levels are lowest at approximately 9:00 in the morning, the same time that studies of circadian rhythm indicate hunger is lowest. This is also generally the longest period of the day where you have not eaten. This reinforces the fact that hunger is not simply a function of ‘not having eaten in a while’. At 9:00, you have not eaten for about 14 hours, yet you are the least hungry. Eating, remember, does not necessarily make you less hungry. There are 3 distinct ghrelin peaks corresponding to lunch, dinner and the next day’s breakfast. This is not a coincidence, but indicates that hunger can be a learned response. We are used to eating 3 meals per day, so we begin to get hungry just because it is ‘time to eat’. But if you don’t eat at those times, ghrelin DOES NOT CONTINUALLY INCREASE. After the initial wave of hunger, it recedes, even if you don’t eat. Hunger comes as a wave. After it passes, it loses much of its power. Ghrelin spontaneously decreases after approximately 2 hours without food consumption. If you simply ignore hunger and don’t eat, it will disappear. The average ghrelin levels over 24 hours of fasting decreases! In other words, eating nothing made you less hungry. We’ve all experienced this before. Think of a time that you were too busy and worked right through lunch. At about 1:00 you were hungry, but if you just drank some tea, by 3:00 pm, you were no longer hungry. Ride the waves – it passes. Same goes for dinner. Further it has been shown that ghrelin spontaneously decreases independently of serum insulin or glucose levels. Eating more sometimes makes you hungrier, not less. In the same vein, eating less can actually make you physically less hungry. That’s terrific, because if you are less hungry, you will eat less, and are more likely to lose weight. This same effect happens over multiple days of fasting. Over 3 days of fasting, ghrelin and hunger gradually decreased. Yes, you read that right. Patients were far LESS hungry when they didn’t eat for three days. This jives perfectly with our clinical experience with patients undergoing extended fasting. They all expect to be ravenously hungry, but actually find that their hunger completely disappears. They always come in saying ‘I can’t eat much anymore. I get full so fast. I think my stomach shrank’. That’s PERFECT, because if you are eating less but getting more full, you are going to be more likely to keep the weight off. There’s also the substantial difference between men and women. There’s only a mild effect for men, but women show a huge decrease in ghrelin. Women would be expected to have much more benefit from fasting because their hunger drops more. Many women have remarked how a longer fast seemed to completely turn off cravings. This may be the physiologic reason why. Intermittent and extended fasting, unlike caloric restriction diets, help to fix the main problem of weight gain – hunger. Ghrelin, the main hormonal mediator of hunger decreases with fasting, making hunger a manageable problem. We want to eat less, but be more full. Great information, Dr. Fung! This confirms why OMAD works best for me throughout the week. I don’t really think about food until I begin eating it! I feel way better in a fasted state than a fed one. I am shocked that I can even say that! Thank you for your continued support of those of us trying to keep chronic disease at bay. This truly works and I am so grateful that you offer your expertise to the world. When I try OMAD I feel overstuffed and uncomfortable from trying to eat enough calories in one meal. In spanish there is a saying “en el comer y en el rascar, todo es empezar”. Ir can be traslated to “ for eating or scratching, everything is to start “….. I found myself far more hungry in the morning if I eat late at night. If dinner at 6pm I feel sick next day for breakfast if I try to eat. Must make sense! me exactly! Late night snacks/meals are complete trouble!